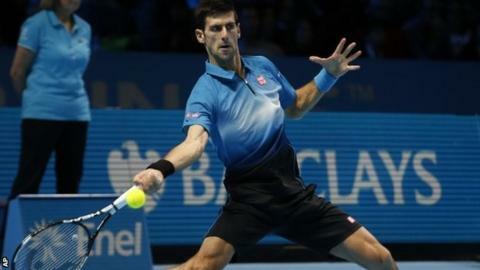 Novak Djokovic joined Roger Federer in the last four at the ATP World Tour Finals with victory over Tomas Berdych in London. The world number one required just one set to qualify and won his final group match 6-3 7-5. Federer had already won the group but earlier maintained his 100% record with a 7-5 4-6 6-4 win over Kei Nishikori. Djokovic will face Rafael Nadal in Saturday's semi-final, before Federer takes on Andy Murray or Stan Wawrinka. The British number one and the Swiss number two will play for the remaining semi-final place at 20:00 GMT on Friday. It was always going to be a tall order for Berdych to claim the straight-sets win he needed to edge out Djokovic - the Czech had won two of 22 matches against the Serb, and none of 17 on hard courts. He managed to recover an early break of serve but Djokovic moved ahead again and clinched the set he required after 42 minutes. Berdych, 30, still had the £109,000 on offer for every round-robin win to play for and again fought back from a break down in the second, but Djokovic broke for the fourth time at 5-5 and closed it out. "I just waited for a game with more second-serve opportunities and that's what happened at 5-5," said Djokovic. "It was a solid performance, I think. We both can have done better. It's been a long year and we did our best. "Rafa has another match tomorrow and I'm going to watch that a little bit with my team and prepare. "Hopefully I'll be able to perform at my best because that's what's needed to win against him." The Swiss had qualified with victory over world number one Djokovic on Tuesday, but Nishikori still had a chance to progress and pushed the third seed to the limit in a match he did not need to win. He was broken twice in a row in the first set but prevailed in game 12 after some fabulous play around the net from both men, and then opened up a 4-1 lead in the second. Nishikori's day was not done, however, as the Japanese 25-year-old hit back with five games in a row to level after one snatched Federer forehand that must be among the worst he has ever hit. The 17-time Grand Slam champion appeared rattled at 0-40 down early in the third but served his way out of trouble and built another 4-1 lead - only to see Nishikori fight back again. A double-fault by the eighth seed on game point at 4-5 opened the door for Federer and he converted his first match point with a clinical smash. "It was extremely difficult," said Federer. "It was a good match, with more breaks than we are used to. Kei is a very good returner, especially on the second serve. It was a very physical match, but I enjoyed it."